1. How was the asphalt manufactured? Make sure the municipal paving contractor you choose knows the asphalt manufacturing process inside and out. Just like any recipe, the right mix of ingredients and the preparation all affect the quality and durability of the final product. At Espina Paving, for instance, we manufacture our own asphalt fresh, with the right mix of ingredients based on the needs of the municipality. This ensures that the asphalt we install on each road is ready to withstand the climatic and traffic demands of the location where we install it. 2. How do you ensure proper water drainage? 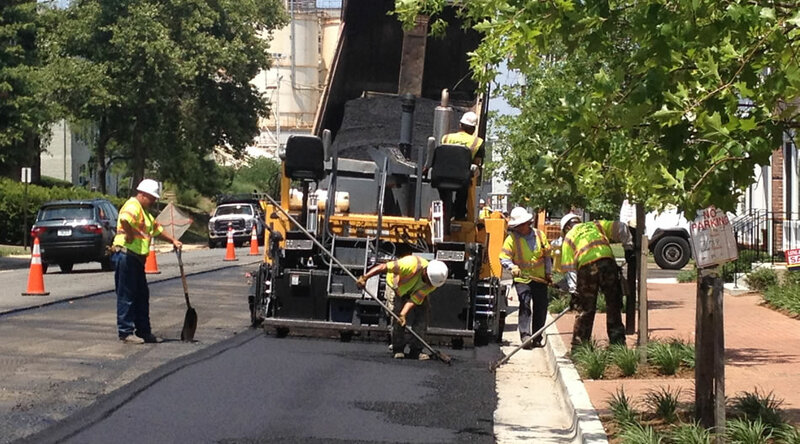 This aspect of municipal asphalt pavement installation is absolutely critical. Here in Northern Virginia, we have a lot of moisture. We can have torrential downpours, major snowstorms, and the relentless freeze-thaw cycle for a few months out of the year. When all this water doesn’t drain properly, it can damage the subbase under the pavement and cause premature cracking, buckling and potholes—all of which can mean expensive repairs and safety hazards for residents. So make sure your contractor tells you exactly how they will prepare for drainage from the roads and parking areas they install. Espina Paving is not only very particular about drainage on all of our installations, but we also manufacture and install a new porous asphalt mix that further improves drainage and durability. 3. What are your compaction procedures? This is another essential step to any municipal paving installation. If the underlying layers of soil beneath the paving job are not evenly and thoroughly compacted, the road on top of it is more likely to suffer buckling and cracking. Espina Paving will grade, fill and compact the underlying subbase extensively to ensure that it remains smooth and stable underneath the asphalt for years to come. 4. Describe your preventative maintenance processes. During the municipal paving contractor bidding process, make sure to investigate not just how they will prepare for and install the asphalt, but what they do after the asphalt has been installed as well! Do they include the following in their bid? Prompt pothole repairs and crack filling—Potholes and cracks can still happen, even on well-installed roads. Is the contractor ready and available to make repairs on these problems quickly so they can prevent the cracks and potholes from becoming bigger, more expensive and potentially dangerous? Regular sealcoating—Depending on the amount of traffic and how harsh the elements are in a certain area, we recommend a sealcoating update every 2-3 years. This regular maintenance protects the asphalt from UV damage and water infiltration and surface pollutants. Sweeping services—A regular street sweeping appointment keeps damaging debris off of the road and helps the contractor keep an eye on potential problems so they can be fixed early, before a crack or pothole gets bigger and more expensive to fix. Make sure your interviews with potential municipal paving contractors include these 4 essential best practices questions! And if you have any questions about your next municipal paving project, contact Espina Paving at (703) 491-9100 today for a consultation.